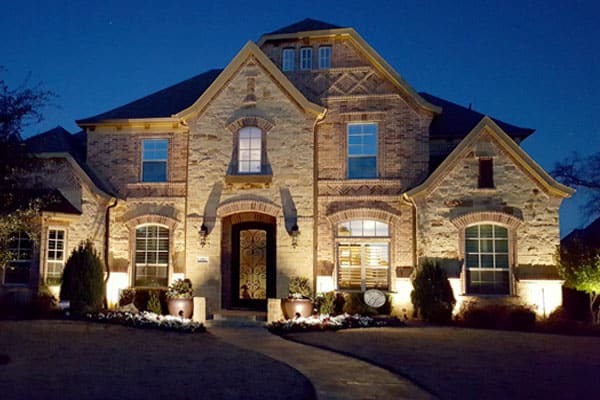 Creative Nightscapes is proud to design, install, and maintain all types of low voltage lighting systems for customers in Farmers Branch and the surrounding area. Our company was founded by Patrick Cheatham in 2004. Patrick went into the lighting business because of his love of home, passion for landscaping, and desire to create beauty in each of his customer’s lives. 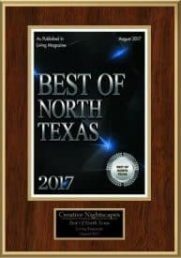 Since the company’s founding, Creative Nightscapes has successfully completed 4,300 plus lighting projects all around DFW. We offer one of the best warranties in all of the outdoor lighting industry. Our goal is to provide every customer with an enjoyable experience and an end result that exceeds his or her expectations. At Creative Nightscapes, we employ all of our own designers and installation crews. We also maintain every system we install. Creative Nightscapes does not use subcontractors. Our company is a member of the Better Business Bureau and the Association of Outdoor Lighting Professionals. We have also been named Landscape Lighting Contractor of the Year by Kichler for four of the last six years. One of the best ways to keep your home in Farmers Branch safe is by installing security lighting outside. When the outside of your home is well-lit, intruders are less likely to come around. Our company can help you design the lighting plan that works best for you. Creative Nightscapes offers lighting to improve the appearance of your pool and enhance safety in the area. With the right type of lighting, you will be able to have nighttime pool parties without worrying about your guests falling on the deck. 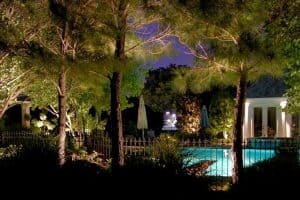 At Creative Nightscapes, we specialize in designing and installing garden lighting throughout Farmers Branch. This type of lighting allows you to enjoy your garden at all hours while simultaneously highlighting some of its best features. Landscape lighting enhances the beauty of your home and adds safety to its exterior. Creative Nightscapes can install all types of landscape lights, including bullet lights, well lights, downlights, floodlights, and much more. Regardless of your goals, we can design a plan that meets all of your specifications. If you have an outdoor patio in Farmers Branch, the right lighting can greatly improve your enjoyment of the space. Whether you want to illuminate all of your patio or simply add some light to certain parts of the space, Creative Nightscapes can help you achieve your goals. The lighting experts at Creative Nightscapes are proud to serve Farmers Branch and surrounding cities, including Carrollton, Addison, and Irving. Please contact us today to learn more about our services. Installed Kichler LED landscape lighting at home in Brookhaven Estates. Placed up lights to accent facade of home, front entry, Crepe Myrtles, and Holly trees.